This guy loves the outfield almost as much as Andres Torres. After today’s shocking announcement that Brandon Belt will be the starting first baseman on Opening Day tomorrow, the Giants brass will have some decisions to make regarding the future of the outfield. These decisions are, of course, delayed by Cody Ross’s trip to the disabled list. I have nothing to add to the growing analysis of Brandon Belt and his major league grit – I already guessed wrong once – so instead I’m going to look a bit in the future, to Babe Ross’s return, and the tough choice the brass will face. The first impact of Belt’s promotion was the departure of Travis Ishikawa, a solid second-string first baseman on a team with 2-3 serviceable first basemen and limited roster space. Ishikawa has always come off as a good guy, and I truly hope he lands on his feet with some other major league club. The outfield, on the other hand, is another story. With Aubrey Huff the ostensible starting right fielder, Ross’s return will bump somebody from a starting role, and probably from the team, with the most likely targets being Aaron Rowand and Nate Schierholtz, assuming that Torres performs as expected and keeps the center field job all season. To say that Rowand is unpopular among Giants fans is a major understatement. After securing a huge contract, he’s been dramatically underwhelming. Any other team that might be interested in taking Rowand on their roster is scared away by the prospect of paying his major salary, so all attempts to trade him away have failed. Now, Rowand’s contract has been the subject of much, much criticism, but let’s ignore that for now, too. It’s sounding more and more like the Giants would be willing to eat most or all of his contract just to put him on another team, so let’s look at him from a playing perspective. Keeping Rowand on the team as a backup outfielder was never a very controversial move. We had room, and he wasn’t that bad… well, mostly we just had the room. Unfortunately, Belt’s addition eliminates an outfield spot, and now Rowand’s presence threatens to push out Schierholtz, a man who has earned the affection of the fans despite never being able to sustain a decent level of production on offense. So let’s look at some stats, and roles that Rowand could play. Nate Schierholtz has a career slash line of .270/.314/.399 – decent average, but not many walks and no power. Aaron Rowand has a career slash line of .276/.335/.442 – better in every category. Not great, but, you know, not terrible. But the problem with Rowand is not his career mediocrity, but rather his downfall upon reaching the Giants. Remember, he had an .889 OPS in 2007 when he was on the Phillies. He went to the All-Star Game, won the Gold Glove, and ranked 22nd in the MVP voting. Instead, let’s look at 2008-2010, his years on the Giants, to make our decision. In his 401 games in the orange and black, Rowand has batted just .257/.318/.405 — almost exactly the same as Big Nate. Defensively, Schierholtz has proven to be a stud. While Rowand certainly covers ground well, Schierholtz has a cannon of an arm, something we’ve never seen from Rowand. We should always take user polls with a grain of salt, but Fangraphs Fans Scouting Report shows Schierholtz as a 72/100 defender, with a 60 rating of Instincts, 66 First Step, 68 Speed, and an 89 Arm Strength with 83 Accuracy. These ratings, on top of being better than Rowand in every category, showed Schierholtz exceeding his average in 2010 for what was one of his best defensive seasons thus far. Rowand, a 45/100 defender, had just 32 Arm Strength with 20 Accuracy, despite his terrific throw in Game 4 of the NLCS. 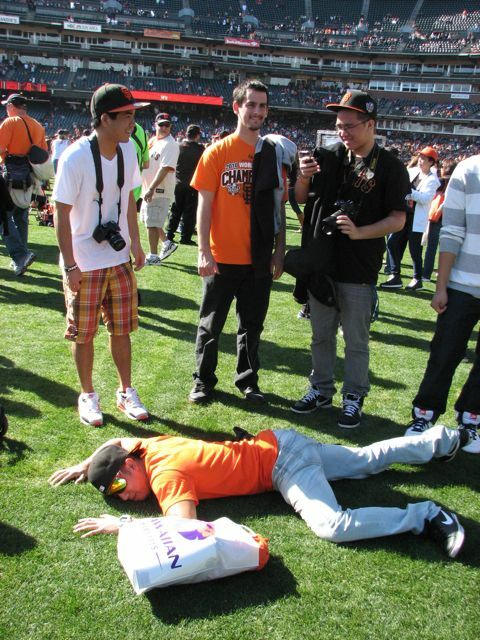 In 2010, after Vicente Padilla broke Rowand’s face and Andres Torres became the starting center fielder and ended up becoming one of the best leadoff hitters in the game (you know the story), Bruce Bochy continued to use Rowand in a platoon split with Torres, given Torres’s .226/.313/.346 hitting against lefties. Rowand responded by lowering the standard even more, hitting just .211/.292/.389 against lefties in 2010, which includes 3 intentional walks he earned. He hit 4 homers in 106 plate appearances, but grounded into 6 double plays, while getting only 20 hits. Despite being a right-handed hitter against a lefty pitcher, a situation that would normally give the hitter the advantage, Rowand fared very very poorly, even for him. On the other hand, Nate, a left-handed hitter, has shown legitimate success against lefty pitchers. In 155 career PAs against lefties, Schierholtz has hit .354/.390/.500 — way, way better than his career totals, even though conventional wisdom would have you believe that the lefty-lefty match-up should give Schierholtz a disadvantage. If Bochy continues to limit Torres’s PAs against lefties, Schierholtz is clearly the better option. So my point is this: with limited roster space, Schierholtz is a better choice. He earned $416,500 in 2010, or roughly 1/33 of Rowand’s salary. He won’t make much in arbitration next year, and he’s club-controlled through 2014. Rowand is going to earn $12 million for each of the next two years. His salary was a waste, but it ain’t coming back any time soon. Though he was once a pretty good hitter, there’s no reason to believe that he’s suddenly going to find “it” again, four years after the fact, at age 33. Getting rid of Rowand would probably involve the Giants continuing to pay him to either sit at home or play for another team, as it’s unlikely that some other team would pay any substantial portion of his salary, given his performance. If anyone can show me a possible scenario in which you’d prefer Rowand over Schierholtz, I look forward to hearing it. Until then, let’s reward good play instead of poor decision-making by the management. Is there anything stopping the Giants from sending Rowand down to the minors? I presume even if other teams could pick him up, there’s no way they would because of his ridiculous salary (or if they did, we’d be thrilled). I’m pretty sure he has a no-option clause in his contract. Most big contracts stipulate he has to be on either the roster or the DL. Don’t quote me on it, just don’t expect Rowand to be in the minors.